I also have some notes from the PBS Las Vegas special here along with a lot of pictures from the Las Vegas Strip, Fremont Street, and more. This blog is almost exclusively dealing with the travel and tourism side of Las Vegas, one of the world's hottest destinations. However there is a lot more to this city including the University of Las Vegas, residential neighborhoods, parks, and much much more. 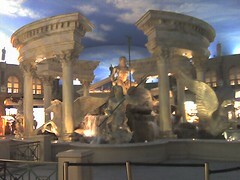 We'll post Las Vegas relocation information in the future and more about retirement in Las Vegas, but for Las Vegas Retirement information click here. Wolfgang Puck is a culinary legend who does not seem to tire of bringing new amazing restaurants into play, especially in Las Vegas where he just opened CUT, a very upscale steakhouse in the Pallazzo, itself a new all suites venue located adjacent to the massive Venetian Sands complex. Synonymous with fine food and celebrity clientele, Spago continues to be the preeminent Las Vegas trendsetter in cuisine, service and design. Distinguished as the spark that ignited the Las Vegas culinary phenomenon, Spago is located in The Forum Shops at Caesars just steps away from the casino and Colosseum Theatre. The restaurant’s dramatic, yet warm interior design presents a sophisticated and stylish environment for the applauded California-style cuisine of Chef Wolfgang Puck. With indoor patio dining in the casual café, considered as the best people watching in Las Vegas, and a more formal dining room with two private banquet facilities for special events, Spago provides a variety of dining options. Spago consistently dazzles in a city known for its many stars and remains one of the most popular dining spots for tourists and locals alike. When the bold flavors of Asia meet the creativity and passion of America’s most innovative chef, Wolfgang Puck, the result is the unique Asian cuisine served at Chinois. Located inside the Forum Shops at Caesars, this sister branch of Santa Monica's Chinois on Main, originally created by Barbara Lazaroff in 1998, offers a hip, contemporary environment with additional design work by Todd-Avery Lenehan. Perfect for mixing and matching, the menu includes modern interpretations of Asian classics to produce an incomparable dining experience. Chinois also features a full-service bar and alluring private dining space. CUT in Las Vegas is the second location for master chef and restaurateur Wolfgang Puck’s critically acclaimed, award-winning Beverly Hills steakhouse of the same name in the Beverly Wilshire, a Four Seasons Hotel. Widely acknowledged as one of the most popular restaurants in the United States, CUT has raised the bar within the fine dining industry and has garnered high praise from prestigious publications including the New York Times, Los Angeles Times (Three Stars), Wall Street Journal and Wine Spectator and was named one of the top three steakhouses in America by Bon Appetit Magazine. Located at The Palazzo Resort Hotel Casino in Las Vegas, Avery Brooks & Associates designed the 160-seat restaurant and 60-seat bar, providing a modern aesthetic to the traditional steakhouse. Adjacent to the restaurant’s main dining room is an energetic, upscale bar and lounge showcasing exclusive custom cocktails, classic drinks and a smaller menu called “Rough Cuts” featuring CUT’s popular appetizers. It provides a perfect vantage point to people watch into the bustling Shoppes at The Palazzo, overlooking the famous Barneys New York. Private dining space also is available featuring a fully retractable bronze glass wall that opens to a contemporary wine display. Postrio Las Vegas combines the style of Wolfgang Puck’s critically acclaimed San Francisco restaurant with the romantic ambiance of Venice, Italy. Located on St. Mark’s Square in the Grand Canal Shoppes in the Venetian Resort Hotel Casino, the restaurant provides a perfect setting for both casual and more formal dining. Offering a stellar menu of seasonal American cuisine with Mediterranean influences, Postrio offers guests two dining experiences. The elegant and intimate dining room features colorful jewel tones and trademark Venetian design elements. For a more casual setting, Postrio offers a festive patio on St. Mark's Square. The restaurant also features two private dining rooms with a separate bar. I think it was About.com's Las Vegas guy who said he thinks this is the best Chinese in Las Vegas and one of the best restaurants of all. 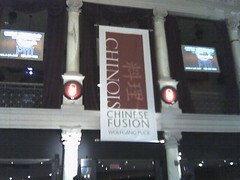 Wolfgang Puck's "Chinois" is in the Caesars Shops which are connected to Caesar's Palace Hotel and Casino on the Las Vegas Strip. Prices are moderate here at Chinois - expect to pay $25 per person and up for a nice meal. The decor was very appealing - upscale but not extravagant. If you are a big Elvis fan there is a helpful web page from Vegas.com will help you find your Elvis in Vegas. Click here for Vegas.com's guide to Elvis stuff in Las Vegas. You may want to check out Legends In Concert at the Imperial Palace, with a big show featuring Elvis and other legends. Add the meal option which is only about $60 vs over $50 without the meal. If you are on tight budget (or just frugal), check out the discount show ticket places along the strip which often offer half price show tickets. Ask at your hotel desk for the location and best strategies to get discounted tickets. Generally in Las Vegas if you are flexible about days, seating, and shows you can find much cheaper entertainment than if you insist on a specific headliner at a specific time, which will generally run you full price and range from $50 to $250 depending on the show.